Personas are hypothetical archetypes of potential customers that aim at representing them throughout the design process. They are not real people or average users, but a group of certain users that behave in similar ways and display the key attributes of the social group they represent. Personas are an extremely useful tool to guide the development of a product or service that meet the user goals, needs, wants and expectations. In the Lean UX methods, Personas are created based on assumptions (proto-personas), and then verified against real data. For Personas to be effective, it is important to separate them in 2 groups: Primary and Secondary Personas. In the book “The Inmates Are Running the Asylum”, Alan Cooper suggests to design for just one personas as this will result in a more successful product/service. It is possible to have more than one Primary Personas but the less Personas, the easier it is to define an MVP and describe a product/service to a customer. Demographic details (e.g. name, age, country of residence, salary, etc). – “User Type”, “Proto-Personas” or “Draft Personas”. They are not the result of extensive research but are based on assumptions of the team and on personal experiences. They are drafts and needs to be validated with research. – “User-generated Personas”. They are personas made-up by a small group of people belonging to the same segment as the persona created. User-generated personas allow to have access to a lot of information about the user-type without running extensive user research. They are created in design workshops or focus groups. Personas and Market segmentation are two different techniques that are often perceived as conflicting methods, but they are actually complementary tools that organisations can use to design successful products. Here you can read more about the difference between Market Segmentation and Persona development by Elaine Brechin from Cooper Interaction Design. 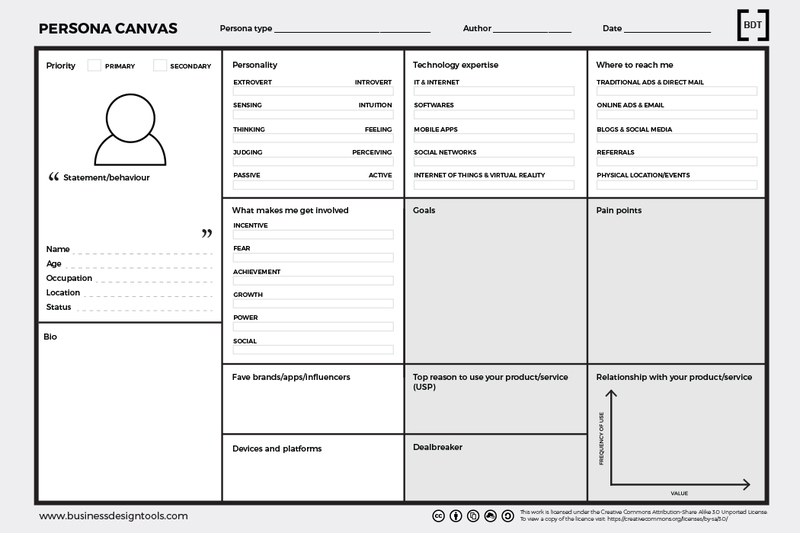 Template to create personas developed by Giulia Piu. The template is an example of the information that can be displayed to describe a Personas. Information vary according to the vision and requirement of each product or service. Alan Cooper, The Inmates Are Running the Asylum, (Indianapolis: Sams, 2004). Laurel Brenda, Design Research: Methods and Perspectives (London:The MIT Press, 2003). Kim Goodwin, Designing for the Digital Age: How to Create Human-centered Products and Services (John Wiley & Sons, 2009).